Congratulations to Steven Eng on his first Lortel nomination for Outstanding Lead Actor in a Musical for his role as Kayama Yesaemon in the Classic Stage Company’s revival of Stephen Sondheim and John Weidman’s Pacific Overtures, directed and designed by Tony Award winner John Doyle. The production has garnered other nods including a Lortel nomination for Outstanding Featured Actor in a Musical for Thom Sesma, Outer Critics Circle and The Drama League Outstanding Revival nods and Drama Desk Award nominations in the categories of Outstanding Revival of a Musical, Outstanding Orchestrations for Jonathan Tunick and Outstanding Sound Design in a Musical for Dan Moses Schreier. Mr. Eng is an actor, singer, director, teacher, producer, and co-founder of the National Asian Artists Project (NAAP), a community of artists, educators, administrators, community leaders and professionals who recognize the need to bridge the work of artists of Asian descent to the many communities the work can serve, from underserved primary school students to seasoned arts patrons. He co-founded the organization with Baayork Lee and Nina Zoie Lam to address what they felt was a significant lack of opportunity for professional Asian-American theater artists to practice their craft and contribute on a broader level to the diversity of the American theater. NAAP seeks to showcase the work of professional theater artists of Asian descent through performance, education and outreach. For more information about NAAP, visit www.NAAProject.org. I caught up with Steven at the 50th Birthday Bash for Classic Stage Company honoring John Doyle and Lynn Angelson. Lia: How did you learn about the nomination and what was your reaction? Steven: I must have been looking at Playbill.com right when the announcement happened, because I hadn’t heard anything. I saw that the nominations were announced, so I read it to see if there were friends who had been nominated. That’s when I saw my name. It was crazy and surreal to read it and not have heard anything. Sure enough, within a couple of hours, I was notified and receiving congratulations from friends and colleagues. Lia: What is Kayama’s journey? Steven: Kayama is a minor samurai who is quickly promoted through the ranks of the Japanese ruling class when American warships appear demanding Japan open its doors to international trade. Through unexpected circumstances and luck (bad or good is up to the audience), he evolves from a traditional Japanese samurai into a westernized bureaucrat. Lia: What did it mean to you to work with this cast and creative team? Steven: Pacific Overtures was a project of a lifetime for me because of both the piece and the people involved. Firstly, Sondheim’s work has always been among the most influential to me in my career, inspiring and driving me to seek work that challenges and teaches me about humanity, and Pacific Overtures has been my favorite of all his works. So to have him watch the show several times and have his input is beyond what I could ever have imagined. Having John Weidman at rehearsals changing his smart and fascinating book was also an unbelievable privilege, and all of us guided by the brilliant director John Doyle was thrilling. And my cast, what can I say except that they were among the most generous and talented actors with whom I’ve ever shared a stage, and I felt the responsibility of bringing the very best I could to match the high level of their work. Lia: This is a very diverse season for theater and the nominated shows. Have you seen a difference for you in casting over the years in the industry? Steven: I can’t really say I’ve noticed a substantial difference in casting for me personally. I will say, though, that seasons of diversity are becoming more frequent, and this is certainly one of them. I’m not ready, just yet, to say that diversity is a regular occurrence. The unfortunate but truthful question is, diverse for whom? Even with diverse seasons and casts, there are still underrepresented groups. 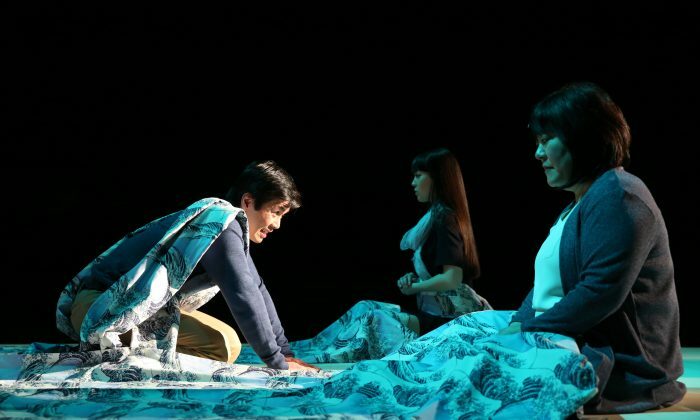 Lia: Last October, NAAP and Prospect Theater Company produced a staged concert of Gold Mountain, a new musical written by Jason Ma, that you were featured in. You were delightful. It was such a celebration of the Asian American actor on stage. What was your experience? Steven: Thank you for that generous compliment! I think Jason Ma is so remarkably talented and it’s just a matter of time until someone with the influence and resources will invest in him and his work. Gold Mountain was such a gift, and to play that role was great fun as well as scary. It was so important to me to do justice to this character and the traditions he represented. Lia: What did it feel like to be in the room of Lortel nominees recently, more specifically with all of your fellow Asian American colleagues? Steven: It was quite special to be there, and among all those fine theater artists. And to see the wonderful Asian faces of not just colleagues, but friends who were also being recognized was so rewarding. While we all have our own paths that lead us there, we do share a common understanding of some similar challenges. Thom Sesma and Steven Eng. Jason Tam, Ashley Park, Steven Eng. Paolo Montalban, Baayork Lee and Steven Eng. Ashley D. Kelley, Kirsten Childs, Baayork Lee and Steven Eng. Lia: Where do you teach? Steven: I teach at New York University’s Tisch School of the Arts in undergraduate drama in two specific studios: the New Studio on Broadway and the Atlantic Theater Company. I also teach at HB Studios. I teach voice and speech, which means spoken voice (not singing), text, articulation and accents/dialects. Baayork Lee and Steven Eng. Lia: What’s next for you? Steven: I’m working on a couple of directing projects now that will occupy me for the summer and early fall. One is a brand new musical that’s being written by Jonathan and Kimbirdlee Fadner, based on the old Chinese legend of the Monkey King. I think it’s a great piece that takes a centuries-old story and gives it some fun modern twists, with great music and fun storytelling. And of course I’m finishing my classes as well as auditioning for my next acting gig. That never ends. I’d also like to mention that National Asian Artists Project (NAAP) is still going strong. While I’m not ready to divulge specific upcoming projects, there are things in the works as we continue to try create opportunities for actors of Asian-descent to practice their craft. In just a year, we’ll be celebrating a decade of operation, and I’m still excited about all the things that are in store. Steven Eng has been acting professionally as a member of Actors Equity since 1995. His work onstage has included New York City and all across the United States in some of the country’s most respected theaters. He was most recently seen Off-Broadway at Classic Stage Company in the NYC revival of Pacific Overtures, directed by John Doyle with reworking by original creators John Weidman and Stephen Sondheim, with new orchestrations by Jonathan Tunick. He’s also performed on London’s West End and in Germany and Cambodia. He has played leading roles from Shakespeare to Sondheim and continually enjoys the challenge of creating roles in new works, most recently Maltby & Shire’s Waterfall. Career highlights have included productions of Henry IV Part 1 and Part 2, Richard II, As You Like It, King John, Miss Saigon, Paint Your Wagon, Honor, and numerous developing works. He’s done some film (released as well as to-be-released), TV (cop shows, soap operas, kid shows), commercials (beer, anyone? ), voiceovers, industrials, and is always grateful to be challenged in new mediums. Steven is also a tenor, having sung in both large concert halls as well as intimate cabaret venues. He holds an MFA in Classical Acting from the George Washington University’s Academy for Classical Acting (Shakespeare Theatre Company in DC). He also holds a BFA in Theatre Studies from Southern Methodist University with a minor in music (vocal performance).